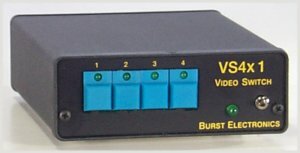 The VS4x1 is a four input, one output vertical interval video switcher. A special feature of the VS4x1 is digital logic that inhibits selection of an unused input, i.e. one where no video is present. The output is dc clamped to zero Volts. This allows for jump free switching between genlocked sources. 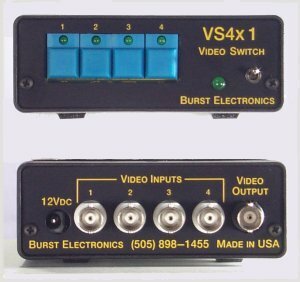 The VS4x1 can be slaved with the AS4x1 audio switcher to allow audio follow video and breakaway switching. The VS4x1 is 12 Vdc powered, wall module included. Options: Y/C, Rack mount, Model KB keyboard remote (contact closure).